If you own a home or like to cook, you likely already know the benefits of having just a few trusty pieces of high-end cookware. They offer exceptional culinary use, and are lovely to look at. An old-fashioned cast iron pan is one such tool. They are versatile, offering a number of uses in the kitchen, and last for generations. That said, there are significant challenges in caring for cast iron cookware that you simply don’t encounter with other kinds of materials. You need to pay special attention the needs of your cast iron cookware to ensure that it will last a lifetime (or more!). Cast iron pans have been around for over 2,000 years, used in China as early as 3rd century B.C. Since these pans have been around for so long, they have demonstrated that they are relatively safe to use. Modern cookware, in sharp contrast, cannot say the same. Aluminum can react with food and be absorbed in large amounts, and there is a sharp and unsettling correlation shown between too much accumulated aluminum and the occurrence of diseases like Alzheimer’s. Furthermore, other types of cookware, like non-stick pans, cannot be used on high heat and are easily scratched. Pans with damaged Teflon coating are unsafe to use. Stainless steel cookware is safe to use, but if your pans develop hot spots, your food will burn. The same goes for copper bases on stainless steels pans, which aren’t suitable for high heat cooking like searing. Cast iron pans, however, can be used for cooking on high heat. While the iron in the pans can react with acidic food, the seasoning on the pan will serve as a barrier. If any iron leaches into your food, it does not pose a health risk, as iron is a necessary mineral. Furthermore, cast iron pans are both tough and durable. Yes, they might be heavy, but they have the potential to offer hundreds of years of service. These pans won’t break, and they won’t stick. Even if a pan looks old, it is easy to clean it up and re-season it. If you use a cast-iron pan, you can also cut down on the amount of cooking oil you need to use. When seasoned well, they act just like nonstick pans. You can cook on high heat without having to worry about burning the food or making it too mushy. They prevent food from burning, as they cook evenly and can cook several inches of food above its service. Finally, cast iron pans are easy to maintain. You can rinse them while they are still hot, and use metal spatulas or ladles without having to worry about scratching the pans. Despite their myriad advantages, some folks still shy away from using cast iron cookware. They do have some limitations, as they are heavy and need to be handled carefully in cleaning and seasoning. You need to clean them thoroughly after cooking – they can’t sit around like other types of cookware. They also require re-seasoning after every use, which can be time consuming. They also require frequent use, with infrequent use causing problems with the pan’s seasoning. What Kind of Cast Iron Pan Should I Get? A good cast-iron skillet will quickly become your favorite piece of kitchen equipment, meaning that you should consider spending a little bit more money on this product than you might on others. Consider a cast-iron pan with user-friendly features, like a silicone handle cover, as well as those that are pre-seasoned so that you can use it right away. Many people swear by antique cast iron pans, and for good reason. A quality cast iron pan can last for many years, and it’s a pretty cool experience to be able to cook with a pan from another century. 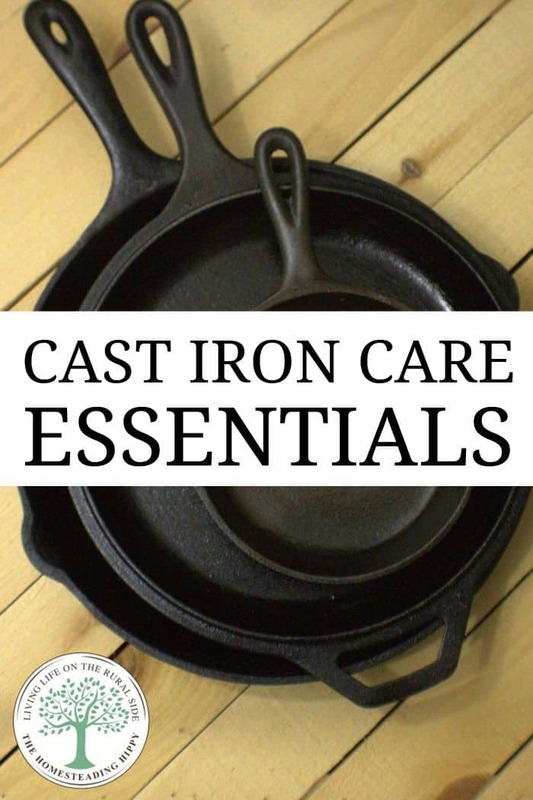 Whichever type you chose, consider investing in additional equipment to help make taking care of your cast iron a little bit easier. For example, a chainmail scrubber will help clear away food and rust more easily, without having to worry about scratching the seasoning of your pan. There are also good cleaning liquids that you can use to clean your pan between seasonings without causing rust. One of the most critical pieces of caring for your cast iron pan is in how you cook with it. Let the heat build slowly no a low setting before adding food, rather than allowing the heat to start on full blast. This will allow heat to be distributed more evenly, and you won’t have to worry about food sticking to the pan or burning. Make sure you exercise caution when picking up the pan, as the whole unit, including the handle, will become hot. Another tip when cooking with cast iron pans is to consider the type of food you are cooking with it. Some foods, like citrus and tomatoes, contain high levels of acid. These can wear away at the pan’s seasoning. While you can always re-season your pan, this can be a bit of a drag. Many people shy away from using cast iron pans because they are nervous about how they should go about cleaning them. However, the basics are pretty easy to remember. Don’t use soap, and don’t put it in the dishwasher (or much water at all, really). You should also avoid using abrasive textures like steel wool, which can strip the pan of its natural coating. The easiest way to clean your cast iron pan is to do so while it is still warm. Fill it with hot water (don’t submerge it, though) and use a plain sponge or nylon brush to scrub the pan. It’s good to use the hottest water possible and to clean immediately after using your pan. This is largely for sanitation reasons. Since you can’t use soap, it’s a good idea to use the hottest settings possible, and right away, too, to avoid bacterial buildup. While you’re cleaning, be careful. Don’t get too excited about scrubbing – be gentle! If the pan is still too hot for you to clean, use a pair of insulated gloves or a set of tongs to scrub the pan. Once all food residue is rinsed off, rinse it again in warm water. If you have particularly stubborn foods (crusty cheese, anyone?) combine a quarter cup of salt and a bit of warm water in the pan. Use a wooden spatula to scrape the bits of food from the pan. You can also reheat the pan when it’s filled with water. Bring it to a full boil, and then scrape the particles of food off as they loosen up. Once the pan is clean, wipe off any excess moisture with a clean, non-abrasive dish towel. You can also dry the pan off on a low temperature over the stove. You have to make sure your pan gets thoroughly dry, as it is particularly susceptible to rust. Just a little bit of water can spell disaster for a cast-iron pan, which is also why you should never put your cast iron pan in water to soak. A bit of heat on the stove will allow any remaining liquid to evaporate before you need to store your pan. Another tip in extending the lifespan of your cast iron pan is to lightly coat it with oil and reheat it for just a minute or two to help restore any seasoning that might have been lost during the cooking and washing process. You should also store your pan with the lid off to protect against rusting. Some people even place paper towels inside the cookware, which helps to absorb any moisture that still might be present. Seasoning is the process of developing a permanent coating on your pan to protect against sticking and burning. New cast iron pans often come pre-seasoned, but in most cases you will need to season again or re-season if a pan was mistreated in a previous life. To season a pan, you should use vegetable oil, butter, olive oil, or any other kind of fat. Oils that are higher in omega-3 fatty acids work best at this job, as they tend to be more drying. They will, as a result, produce a durable, hardier coating. The oil highest in omega-3s is, ostensibly, flaxseed oil, so consider using this type of oil for the longest lasting results. Whatever type of oil you use, the process of seasoning is the same. All you need to do is pour a few tablespoons of oil into a dry pan and then spread it around the inside and outside of the skillet. Use your hands or a cloth to scrub the oil into every angle and divot in the pan. Wipe off the excess oil, leaving a thin film over the entire pan. Then, bake the skillet upside down for an hour at 375 degrees. To keep your oven clean, it’s not a bad idea to put a pan on the rack below your cast iron pan to help collect some of the drippings. For best results, repeat this process a few more times. Let the skillet cool completely before repeating. You want the surface of your pan to look glossy when it’s dried. This indicates successful seasoning. When Do I Need to Re-Season My Pans? Your cast iron pan will need to be reseasoned if food starts to stick to the pan too easily during cooking. Another sign that it has passed its prime is that the surface might appear dull or rusted. You want the skillet to always appear shiny and smooth. Rust indicates that a pan has not been properly seasoned, which can happen when a pan is new and has not been broken in. If the pan is scrubbed too hard or not dried adequately, this problem might also arise. To remedy this, simply sand off any of the rust and then reseason the pan. The bottom line? Cooking with cast iron is a fantastic way to improve the flavor and nutrition of your food, and to streamline all of your kitchen equipment into one single (albeit heavy!) and handy tool. Consider investing in a cast-iron pan today, and following these essentials to make sure your new equipment lasts long into the future. Great info! I have always love cast iron cook ware from my early teen years to now in my 60’s.